The success of any Stream Restoration and Stabilization project (refer to this page) depends on the quality of field assessments and surveys, done before a single log, rock, or shovelful of dirt moves. Stream Morphology is the study of the physical features and processes of water flowing through a bounded channel. A stream morphological analysis builds on observational findings from a Stream Visual Assessment (see this page) and a Stream Morphological Analysis (click here) by adding careful quantitative measurement and analysis to calculate variables such as stream discharge and stream velocity. Discharge is the amount of water flowing past a single point during a unit of time (24 hours, one hour, one second). Velocity is the speed at which the water moves. To get accurate values for discharge and velocity, a number of measurements along the length of the stream's channel are used to construct a longitudinal profile or longpro that is a schematic representation of features such as riffles, runs, pools, and glides. 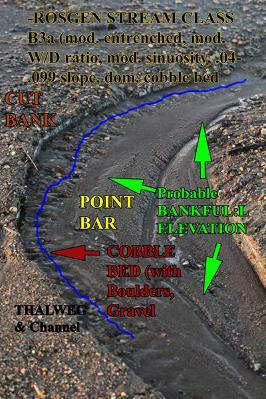 Further measurements are required for a channel cross-section, another schematic of the riparian terrace, floodplain, floodprone area, wetted perimeter, bankfull elevation, water level at flood stage, and other features. These quantitative measures allow for an accurate classification of a given stream or stream reach according to a system such as the Rosgen stream classification system. In the Midwestern US, many major rivers are Rosgen "C" streams, meaning that the channel is meandering or sinuous, the slope of the channel is very low, and the stream has features such as cut banks, point bars, and riparian terraces. Quantitative measurement and analysis of stream morphology is essential to a stream stabilization or restoration project. The results of this analysis define the limits and potentials for recreating meanders, resloping the banks, adding rock for riffles, building instream structures that protect banks and capture sediment, recreating low floodplains, and reducing the damaging effects of floods. Leeward Solutions is equipped with the expertise and tools to conduct morphological measurement and analysis, and clients benefit from the interpretation of results for stream restoration and stabilization work.